Agora Architecture was tasked with creating two new education centers and designing a courtyard gathering space for Cowley College in Wellington, Kansas. We spoke with the Principal Architect on the project, Cheri Hulse, and other members of the design team about how VR positively impacted their workflow and helped them impress their client. What prompted you to consider using virtual reality for the Cowley College project? When we began working with the college, they were looking for a way to view their project before its completion to help with fundraising, and as a solution we provided 3D virtual modeling in addition to the standard rendering. After taking care to look at the College’s needs and plans, it was easy to see that virtual reality could help them get this campus off of paper and into reality. 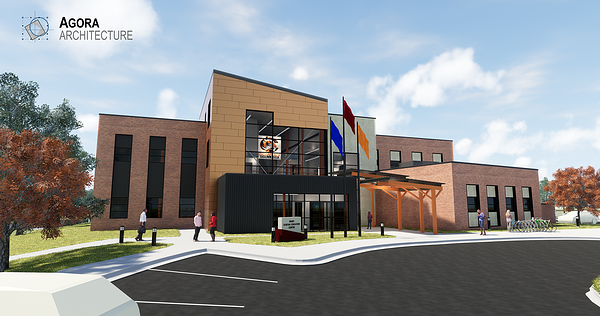 The college planned to unveil the design at a groundbreaking ceremony at the site of the new campus and expected around 250 people to attend, including 25 dignitaries from the State of Kansas. 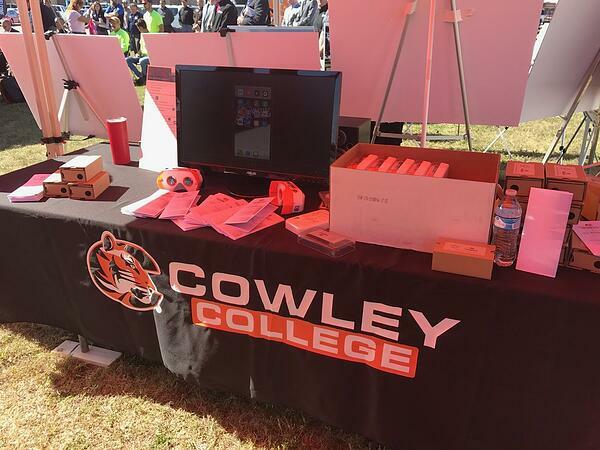 Cowley College is a great partner to have in this endeavor because they want to push the envelope of education and we want to push the envelope of technology, so using VR made perfect sense. What steps did you take to produce VR content? Our steps to using VR did not follow a straight path. Because we hadn’t offered the service before, we did a lot of research and even changed directions a few times before deciding on the best approach. Regardless of how we were going to get the model into VR, we knew we would work in Revit to create our models. We found that exporting our Revit renderings straight from Revit didn’t provide the aesthetic quality we were wanting, especially in the outdoor areas that we were showcasing. We used an add-on rendering program that really enhanced the grass, trees, people and building finishes. Finally, we uploaded these to Scope for easy distribution and accessibility. How did you use VR at the groundbreaking ceremony? Because of the vast number of people who would need to be accessing VR at one time during the groundbreaking, and the subsequent need of it to be portable, we chose to use cardboard viewers. We used both cardboard and plastic viewers which were distributed during the groundbreaking for attendees to take home and show others. These were accompanied by a step-by step instruction brochure we created to show how to download the Scope app, put in the code, and use the viewer. This allowed us to create VR that is portable and easily shareable with many people in a short amount of time. For those who did not have a compatible smartphone or who otherwise did not want to use their personal phone for viewing, previously set-up devices were available to use at a booth and student ambassadors from the college were available to assist. Using VR to easily communicate the design was a great success, and the people at the groundbreaking ceremony were very impressed and excited to be able to see and understand Phase 1 of the campus before it was even built. Their reaction was pure amazement and awe. These are the reactions we got not only from people at the groundbreaking who had no idea what to expect, but also from the people who have been involved with the design process from the beginning and had an idea of what the campus was becoming. Our clients enjoyed the seamless feature of moving from one panorama to the next. They didn’t have to take their phone out, scan a QR Code, or do something else that involved any inconvenience. It was very simple and effective. 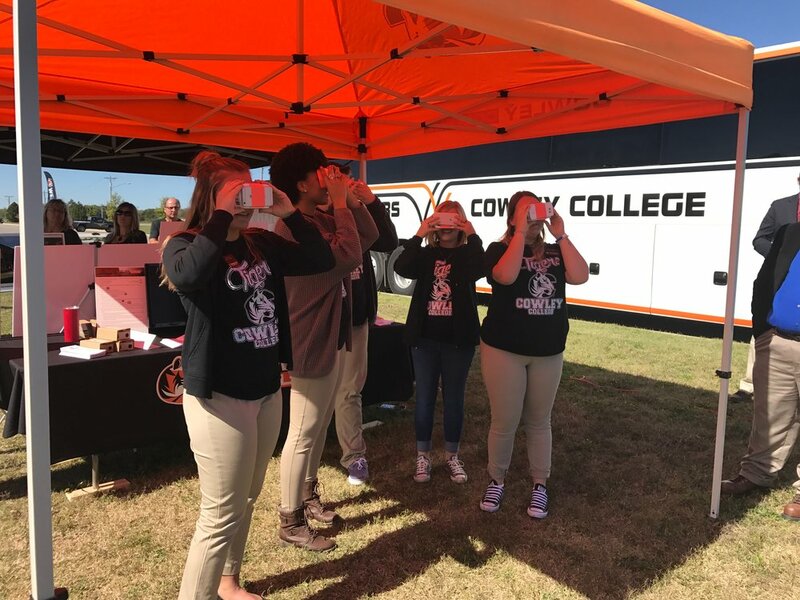 Cowley College did a fantastic job of setting this very large and impressive groundbreaking ceremony to be such a success and VR took the whole experience to the next level. In the future, we plan to upload design and construction progress images to Scope as the project progresses, sustaining interest in the project up throughout completion. Distributing the cardboard viewers and Scope codes was key to our plan to implement continued VR updates. What were the goals you set out to achieve by using VR? Our goal was to provide the client with an attention-getter. We often run into motivated people who have a fantastic idea for a facility, but they either cannot visualize design from the 2D drawings that we use or the people from whom they need support cannot visualize the design. Offering VR provides our clients the ability to impress their boards, contributors and major stockholders. Convincing these people to invest in and support the project can be the piece that makes or breaks a dream. We also expect that this extra visualization piece will enhance our communication with our clients throughout project design and construction. Our client is already able to enter VR and experience the design, which has enabled them to more easily talk about what they like and what they want to change. In turn we are able to design a product that best represents the client’s ideas and needs. How does it compare to not using VR? Were there any quantifiable gains? Compared to not using VR, there would be less excitement about the project. We believe there would be more questions and more time spent in early design phases. However, because of VR, Cowley College was able to see the design and accept it because it was right there in front of them and they loved it! Also, I think we would all agree that it improved our relationship with the client. The glowing comments each designer has received since revealing the result of VR have been very generous. The client is pleased and excited and is enjoying all of the fun aspects of creating a new campus because of VR. Did it improve/facilitate coordination within your team as well? It absolutely improved and facilitated coordination within the team. When we initially considered providing VR we thought about the associated costs to us and the extra time spent creating these images. It was easy to feel as if VR only served a single purpose and might not have much use outside of initial client impact. Fortunately, our experience was quite the opposite. We have continuously used VR throughout the design process to choose exterior and interior finishes, colors, layouts and even the final building locations on the site. The contractor selected for the project, Conco Construction, has also been able to view the models in VR and this has helped them to understand and make decisions and contribute to design changes along the way. Our architects have been able to communicate more quickly with each other, and visualize the project and each other’s ideas even better than through drawings and simple 2D renderings alone, enabling us to continuously make improvements to the design for the better. When one architect did not fully understand or was not on board with another’s idea it was very simple to view the model in VR and get a definitive decision without wasting any time. We were also able to make more informed decisions. A major decision helped by VR was in changing the roofline of one of the buildings. If not for VR, we would not have been able to identify and improve this area as quickly, before it may have incurred major costs to modify. Did using virtual reality meet or exceed your expectations? VR and its benefits went beyond expectation and far exceeded our goals. As mentioned before, we knew it would benefit the client in gaining funds and support, increase project communication and benefits related to the client. However, we had no idea how much it would help us internally to refine our design and see what we were designing as we designed it. We can honestly say that the overall building shapes would be different if it had not been for VR, which especially helped with the difficult task of designing a metal building to blend in with the surrounding traditional construction. By introducing VR we think we saved time both internally in decision making and externally with decision making. We were able to button up schematic design in good time because the client was able to understand the design easily and give their approval. Want to give VR a try? Start a free IrisVR trial right now.